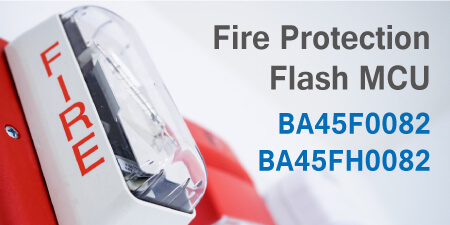 Holtek announces the release of its new low power consumption fire protection application Flash MCU series, the BA45F0082 and the BA45FH0082. These devices will find excellent use in fire protection peripheral product applications such as independent temperature detecting alarms, Input/Output modules, temperature detectors, electrical fire detectors, acousto-optical alarms, fire door monitoring in addition to many others. The BA45F0082 has a 2K×15 Flash Program Memory, a 128-byte Data Memory, a 64-byte True Data EEPROM and 6-level subroutine nesting. The device also has a range of practical peripheral functions such as 10-bit and16-bit timer modules, a multi-channel 12-bit A/D converter, a low power consumption high speed internal RC oscillator and so on. The fully integrated highly accurate internal high speed RC oscillator can provide a fixed system frequency of 2MHz with a current consumption of only 200µA at a power supply voltage of 3V. The device is especially suitable for use in independent temperature detecting alarms. The BA45FH0082 contains all the functions of the BA45F0082 but also includes a two line type bus communication circuit and a 3.3V LDO, thus reducing greatly the required number of external components. The device is suitable for bus connected fire protection system peripheral product applications, such as acousto-optical alarms, temperature detectors, Input/Output modules, fire door monitoring in addition to many others. The BA45F0082 is supplied in a 16-pin NSOP package type while the BA45FH0082 is supplied in 16-pin NSOP and 20-pin SSOP package types. These package types make them applicable for use in different fire protection peripheral product applications.